Every year, more than 50 workers are killed and 4,500 are injured in scaffold-related accidents. Of these accidents, suspension ropes breaking caused 20% which is why having OSHA safety training is important. To protect workers who use or work around scaffolding, OSHA has implemented scaffolding regulations (29 CFR 1926.451 – 454) that specify the requirements for using scaffolds, training and more. Meeting these regulations can be demanding, requiring you to either spend time and resources developing a training program yourself, or outsourcing the training to expensive safety consultants. There is an alternative. Happily, there’s an easier way to meet your suspended scaffold training needs. Here at Safety Services we have developed a “Do-It-Yourself” training program that is both simple to administer and will meet all your OSHA requirements. Our Suspended Scaffold training kit is a simple three-step solution that brings all your employees into compliance. Here at Safety Services we have developed a “Do-It-Yourself” Suspended Scaffold training program that is both simple to administer and fulfills all your OSHA requirements. This innovative kit features an Interactive Training Program, Student’s Handbook, Instructor’s Handbook, OSHA Regulations, Student Tests, Training Logs, Certificates, Wallet Cards and More. 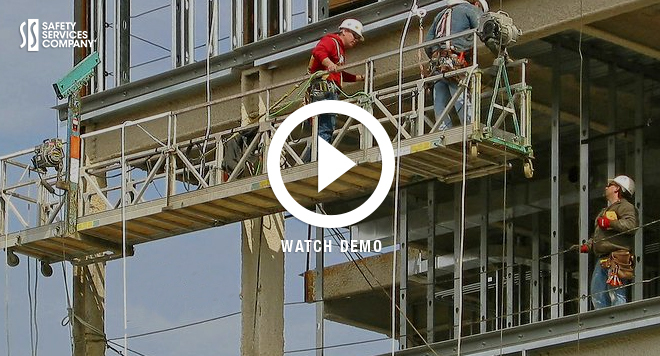 To help you understand scaffolding regulations and keep your employees safe on the jobsite when using suspended scaffolding, we created this training program. All certification through our Suspended Scaffold training program meets or exceeds OSHA requirements. By providing your company with all the necessary material, your designated trainer will be able to deliver the required training quickly, easily, and consistently. If you have any questions about OSHA required training, or are ready to order your Suspended Scaffold training program, give us a call at 1-888-840-9276.